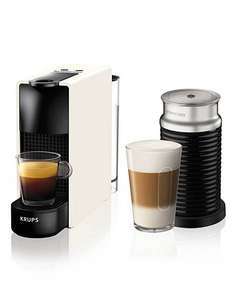 The Nespresso XN111140 Essenza Mini White Bundle Capsule Coffee Machine is a very small and compact footprint machine which is easy to place and move in the kitchen/house. Features two programmable buttons, automatic flow-stop for espresso and lungo coffees, low energy consumption mode after 3 min and automatic power off mode after 9 minutes. 25 seconds heat-up time.